Tight-lipped about its latest offering, the TVS Radeon was launched earlier today as the company’s all-new commuter motorcycle. The bike is targeted at semi-urban and rural markets that promise strong growth and will take on a host of offerings from Hero MotoCorp and Honda Two-Wheelers in the 110 cc segment. There was little known about the Radeon prior to its launch, and the two-wheeler maker has only now spilled the beans on its latest offering. Priced at ₹ 48,400, the TVS Radeon is one of the most affordable bikes in the manufacturer’s stable and here’s all you need to know about it. 1. Unlike urban markets that have a strong inclination towards scooters, the semi-urban and rural markets still show a promising growth for entry-level bikes and this is the market that TVS aims to tap into with the Radeon commuter motorcycle. 2. The target demographic for the TVS Radeon is the age group between 25-35 years. This includes the millennial generation of the semi-urban and rural markets that is categorically different from the urban millennial, according to the company. 3. The TVS Radeon gets a conservative design language, in line with other offerings in this space. The styling is simple and looks efficient, which the customers largely look out for in this segment. The bike gets a large headlamp and LED daytime running lights too. An innovative feature, the Radeon also comes with thigh pads on the fuel tank. 4. The analogue instrument cluster is a dual pod unit, which the company says has been designed to appear more car-like. Apart from the usual tell-tale lights, the bike comes with side stand indicator with beeper. There’s also a smartphone charger, while the rear grab rail gets an integrated carrier. 5. 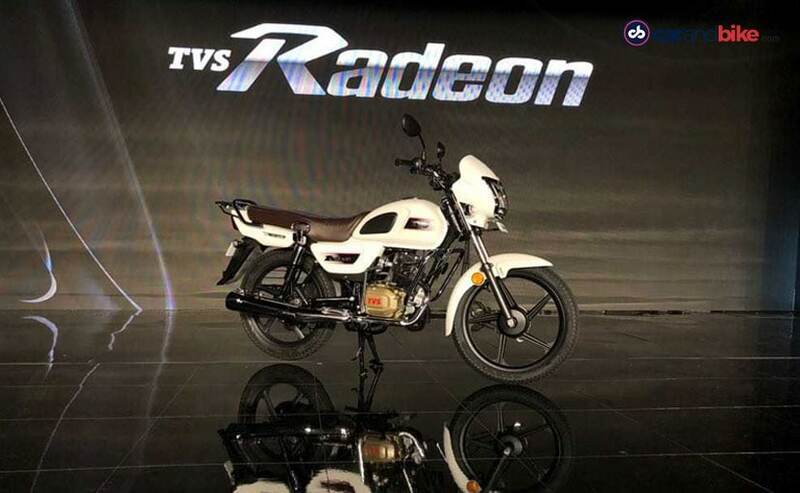 TVS claims that the new Radeon gets the longest wheelbase in its class, while the seat is also the longest in the segment. The bike also comes with flexible turn indicators that allow for better wear and tear. 6. The TVS Radeon is underpinned by an all-new single cradle tubular frame with the engine used as a stressed member. Power comes from the new 109.7 cc single-cylinder, air-cooled Dura Life engine tuned for 8 bhp at 7000 rpm and 8.7 Nm of peak torque available at 5000 rpm. The motor is paired with a 4-speed gearbox. The high capacity air filter and projected spark plug aid in better acceleration, while the intelligent ignition system and anti-friction coated piston is aimed at improved fuel efficiency. 7. The Radeon uses telescopic forks up front a twin shock absorbers at the rear. Braking performance comes from drum brakes at either end. The bike is also equipped with Synchronised Braking Technology (SBS) for more effective stopping power. 8. The TVS Radeon has a claimed fuel efficiency figure of 69.3 kmpl, which makes it one of the more efficient bikes in its class. The motorcycle rides on 18-inch alloy wheels wrapped in tubeless Dura Grip tyres. 9. The TVS Radeon will take on a host of commuter motorcycles including the Hero Splendor, Honda CD Dream, Bajaj Platina, and the likes. 10. TVS Motor Company aims to sell over two lakh units of the Radeon motorcycle in its first year of sales, while deliveries are set to begin by next month. Bookings for the Radeon have commenced at TVS dealerships across the country.